Carbon Monoxide is a real danger to us all and annual boiler and appliance checks will keep us safe. Q: "You are just trying to scare us into having these tests to make money, surely I don't need my boiler and appliances checked every year?" A: Every gas appliance should be checked every 12 months and of course I want you to be around each year for me to check them. After all I want to keep my customers not lose them! Keep yourself, your family and even your pets safe. Get it checked! So what does Carbon Monoxide do to me? Carbon monoxide poisoning can be a deadly condition. It results from inhaling carbon monoxide gas (CO). CO is produced when gas, wood, charcoal, or other fuel is burned. It often builds up when fuel-burning heating and cooking devices are faulty or not properly serviced. CO is odourless, tasteless, and colourless gas. People can inhale it without knowing. If a flue or vent pipe has a hole or incorrectly fitted, carbon monoxide can escape into the house. If a boiler is burning gas incorrectly. If a gas fire has been not been serviced. Using a barbecue grill or camp stove indoors can cause a build up. Running a car engine with the garage door closed will cause a build up. Once the gas is inhaled, it is easily absorbed through the lungs. 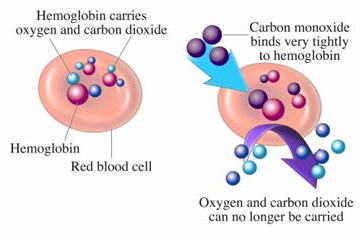 Hemoglobin carries oxygen in the blood to the entire body. CO binds tightly with hemoglobin and takes the place of the oxygen. Tissue becomes starved for life-sustaining oxygen. Brain tissue is very much at risk. Gender: death rates higher in males. Blood, heart, or lung conditions. Headache and dizziness within six to eight hours of constant exposure. Slight headache in two to three hours. Slight headache within two to three hours; loss of judgment. Dizziness, nausea, and convulsions within 45 min; insensible within 2 hours. Headache, tachycardia, dizziness, and nausea within 20 min; death in less than 2 hours. Headache, dizziness and nausea in five to ten minutes. Death within 30 minutes. Headache and dizziness in one to two minutes. Convulsions, respiratory arrest, and death in less than 20 minutes. Unconsciousness after 2-3 breaths. Death in less than three minutes. Whether symptoms come and go. If anyone else in the household feels ill. If you use fuel-burning appliances. Seek medical care immediately. Explain that you think you may have been exposed to carbon monoxide. The doctor may give you oxygen until your symptoms go away and CO levels in your blood drop. Have an professional 'Gas Safe' registered fitter check your fireplace chimney every year. Debris can block vents, making a build-up of carbon monoxide. Have a professional 'Gas Safe' registered fitter check that your gas appliances are working properly. Do not use your gas hob or oven for heating your house. Do not use a barbecue grill, camp stove, or un-vented paraffin heater inside your house or tent. Do not use generators or other petrol-powered engines indoors. Do not rely exclusively on a carbon monoxide detector. Use one only as backup, in addition to preventive measures. Follow manufacturer's directions for installation and maintenance and always have each appliance checked every 12 months. Many of the phenomena generally associated with haunted houses, including strange visions and sounds and feelings of dread, can be attributed to carbon monoxide poisoning, as its symptoms include confusion, delirium, emotional disturbances, and hallucinations. In one famous case, carbon monoxide poisoning was clearly identified as the cause of an alleged haunting. Dr. William Wilmer, an ophthalmologist, described the experiences of one of his patients in a 1921 article published in the American Journal of Ophthalmology. "Mr. and Mrs. H." moved into a new home, but soon began to complain of headaches and fatigue. They began to think they were hearing bells and footsteps during the night, accompanied by strange physical sensations and sightings of mysterious figures. When they began to investigate the symptoms, they discovered the previous residents of the house had similar experiences. An examination of their furnace found it to be severely damaged, resulting in incomplete combustion and forcing most of the fumes, including carbon monoxide, into the house rather than up the chimney. A report published in 2005 described a 23-year old female victim of carbon monoxide poisoning, found delirious and hyperventilating, who thought she saw a ghost while in the shower. A new gas water heater had just been improperly installed in her home, which flooded the house with carbon monoxide when the victim closed all the exterior windows and doors and took a shower. So now are you going to get your gas boiler and appliances serviced once a year?